"Please read carefully before using!" The medical definition of "cure" is the non-reoccurence of pathology within five years after treatment. By the very definition used by orthodox medicine, Cansema® is empirically a proven cure for skin cancer for the majority of those who use the product according to our instructions. An extensive history of Cansema®, in particular -- and escharotics, in general -- can be found in Chapters 1 and 2 of Meditopia®. CAUTION: There are numerous counterfeiters of Cansema® who use our trademark, information, graphics -- even our testimonials, even though they are not connected to us; the formula is not the same; and the performance of their product is substandard to the genuine article! We list known counterfeiters -- one of which we know is receiving FDA assistance in making an adulterated / misbranded version -- on our Fake Program Compensation Program page. This Cansema® User Instructions page is currently being recommended by a company run by Jennifer Wilson / George Ackerson -- who are telling the public that they are us. Do not believe it. We do not and will not provide customer service for their products. WARNING: Please read the following instructions through carefully before applying Cansema®. Do not, in any way, deviate from the following. If you have questions after a thorough reading, please call Alpha Omega for any clarification. Remember, Cansema® will provide results only if you have skin cancer, as opposed to a benign growth. This includes basal cell and squamous cell carcinomas and melanomas of the skin. For information on an alternative to benign moles and warts, see Bloodroot Paste. PREPARING CANSEMA® SALVE: Few such salves, if any (and our Cansema® Salves are no exception), use emulsifying agents, so to get the best results from Cansema® Salves, you should spend a few seconds stirring the contents before applying. For the smaller (22 g.) container, this can be done with a toothpick; for the "clinical sized" jar, we find the best implement to be an ice cream stick. 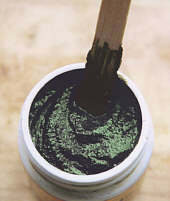 With less than a moment of rigorous stirring, you will notice that the appearance and consistency of the product will change from a black fluffy appearance on the surface to a smooth dark green cream. You will find the latter's consistency yields the best results. Applying Cansema® Salves... Our Cansema® Salves come in a .8 oz. (22g.) container, with the exception of the Clinical Sizes. The product has the consistency of a thick, moist paste. It can easily be self-applied with the fingers and should be spread over a small area of the skin in a thin covering, almost lightly "caked." Wash hands thoroughly before and after applying Cansema® Salves. The applied area will start to tingle shortly afterwards -- anywhere between 5 minutes to 6 hours after the initial application. (In fact, if you feel "nothing" after three to six hours, it is most likely that you will notice nothing at all. After 24 hours, remove the Cansema® Salve and reapply, repeating this process several times.) In some cases, there is a burning sensation with larger area of skin, so it is important to have ibuprofen, or other non-prescription pain killer, available during the process. Areas larger than a square centimeter (or bigger than a U.S. "dime") may require even stronger analgesics. Otherwise, observing good "pain management" may require that the application be done in stages. This involves applying a small amount to the edge of the skin area of concern, waiting for the sensations to die down as the process begins, and then repeating this process on an adjacent area of skin until the entire area has been covered. Observe this same procedure if you are targeting more than one area. Do one at a time. In this fashion, any discomfort is minimized because the entire process, which can at that point last several days, has been spread out over time. This bears repeating: never apply our Cansema® Salves to a large area.It is also a good idea to place a bandage over the area, particularly if the forming eschar (scab) is on a place on the body that might be subject to being bumped or bruised in the course of daily activity. Another thing to consider is that Cansema® Salves can stain clothing, so for practical, aesthetic, and cleanliness issues, covering the site is a good idea. "Deep Loufah Wash" - Many people use a loufah sponge to rigorously wash and prepare the skin before applying Cansema® Salves. This serves to remove some of the dead cells in the top layer of the epidermis (the stratum corneum). Cansema® Salve 'eschar' or scab formation - After 24 hours remove the bandage. Using hydrogen peroxide (H2O2 - 3%, available in most drug stores) and a Q-Tip, very lightly go over the skin, removing any excess Cansema® Salve and other organic debris (i.e. pus, serous fluid, etc.) If a full pus formation is not evident or is incomplete, repeat step 2 and leave the new application on for an additional 24 hours before proceeding. Normally one application is sufficient for small area (the size of a pencil eraser), but no more than three applications are required for larger areas. 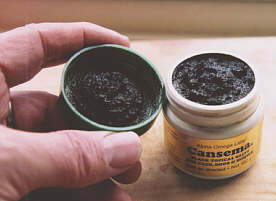 There are instances, however, when repeated applications of Cansema® Salve are required because of "accessibility" problems - although this can be limited using the techniques cited in the preceding section. In order to initiate the escharization process, however, it is vital that Cansema® Salve be able to penetrate and reach the subject site. This can take multiple (three or more) applications, though one to two applications is more common.After the eschar has formed, keep it well protected. You can add Vitamin E or our Calcium Sulfate Concentrate (diluted with purified water at the 64:1 ratio) to accelerate healing - but know that this is better to use once you reach the decavitation stage. (Although recent reports have been submitted where Calcium Sulfate Concentrate was used throughout the entire process as a cleaning agent - acting to accelerate healing and minimize scaring. )Normally the bandage can be left on for a period of 10 days: however, there is may be considerable "drainage," that is, a steady emission of pus; drainage should not be viewed as abnormal. The range of possible response is very little pus and only one bandage ever required, to a regular change of bandages required. You are likely to be somewhere in-between. The eschar itself represents the the opportunity for healthy tissue growth. Everything that follows from there is the body's own reparative responses. From here on out, the body knows exactly what to do and wastes no time doing it. However, to us the days and weeks that follow may seem lengthy.The next stage is the removal of the eschar, or scab. This usually happens within 10 days after initial application. As with any scab, let it fall out when it is ready. Do not pull it out prematurely, although you may find that it will eventually be attached with a small thread of skin tissue which can be easily and safely severed. If you remove the eschar premature, you further risk developing scar tissue. Back to the topTo users in the U.S.: Not intended to diagnose or prescribe for medical, chiropractic or psychological conditions nor to claim to prevent, treat, mitigate or cure such conditions, nor to recommend specific information, products or services as treatment of disease or to provide diagnosis, care, treatment or rehabilitation of individuals, or apply medical, mental health or human development principles, to provide diagnosing, treating, operating or prescribing for any human disease, pain, injury, deformity or physical condition. Potential benefits are recommended based upon traditional uses and may not be generally recognized as substantiated by competent and reliable scientific evidence. Any use of the techniques, education, information, herbal salves and other products or services is based upon customer informed consent and private license. Testimonials represent a cross section of the range of results that appear to be typical with the information, products or services. Results may vary depending upon use and commitment.